Opened my email this morning and BAM saw, Best Buy Black Friday Preview. I was tempted not to click. But then again, I am terrible with suspense and had to give in. Inside I found a one page ad with some pretty cool deals. 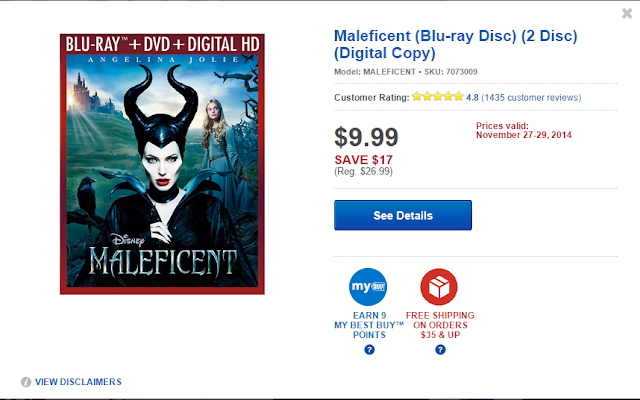 One I am most excited about is for $17 OFF Disney's, Maleficent. Can you believe I have yet to see this flick. I really want to though. I was going to rent it off the Direct TV on demand thingy but it was like $5.99 when I could just wait another 2 weeks and buy it for $10. Check out the preview and let me know in the comments below if any of the preview items are on your wish list / shopping list.